blue fairy, originally uploaded by Charger’s Mommy. We are still snowed in, the streets surrounding our house are 6″ of slush over packed snow and ice in layers. Making for a very messy mixture. Now that it is dark the top slush layer will be freezing again. No plows or sand trucks have been anywhere near our house. So I managed to make another outfit for my neice. 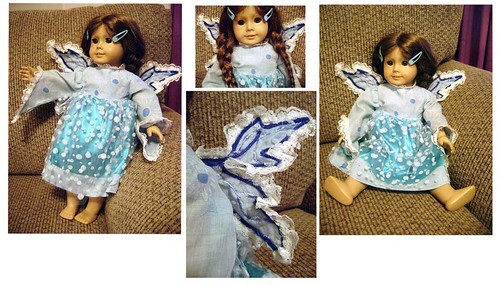 This is a Blue Fairy (which one of my neices was for halloween) American Doll Fariy dress with wings. The dress is a pattern but the sleeves and wings are my own design. I also have some cool fiber that would make for a good blue hair piece if I can figure out how to make it attachable with a nice barret or something. Now to do a twin version in another color for the other neice. This entry was posted in Passions on December 25, 2008 by Sheba.